I had a party with my friends. A friend of mine is a sheaf for Japanese food. 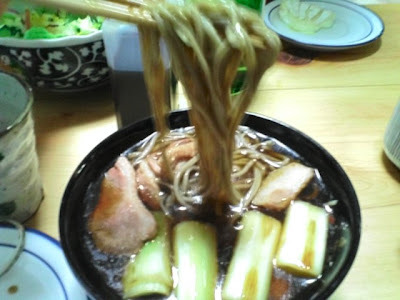 He cooked us Japanese hot noodle called Kamo-Nanban at the party. The noodle is more expensive than usual ones. Because making the soup takes 6 hours and the meat is duck which is not so common in Japan. However, this time it was free of charge! What's more it was YUMMY! !